It's March and the days are getting longer, hooray! Don't forget that this weekend it's time to "spring ahead" with our clocks. 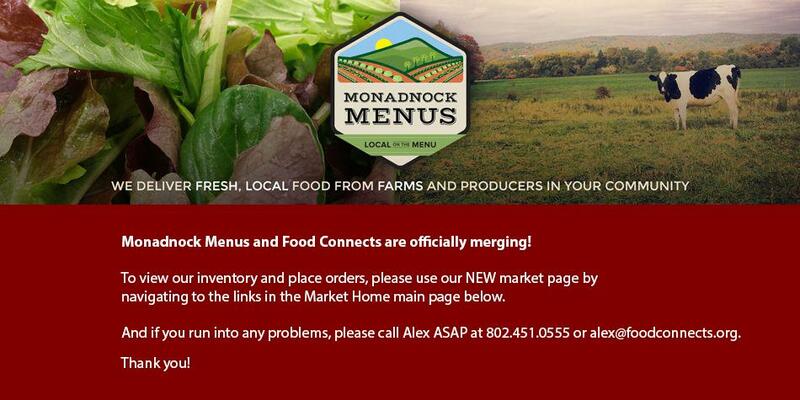 The plants aren't the only thing that's growing, Monadnock Menus is growing too! We have a few buyers in the Peterborough area that we welcome to the program. We are really excited about the expanding support for local food. Please pass along names of anyone you know that might be interested in participating in Monadnock Menus along the 101 corridor. We're hoping not to experience any growing pains, but please do pass on any feedback - positive or constructive - to Sara. We want to make sure we are serving our producers and our buyers well. We had our first Wednesday delivery last week, which seemed to go smoothly. See below for a reminder of the order deadlines, to ensure you get what you want for Wednesday. And read on below for some new products and product sizes. Sawyer's Artisanal Cheese is made by Joseph and Sonia Sawyer and their son Ian. Joseph grew up on a dairy farm in Walpole, NH and the spirit of growing and creating food from the land has always been a part of who he is. Seven years ago his curiosity of cheese making nudged him to explore the cheese operation of Boggy Meadow Farm where he was soon hired and worked for several years. As his desire to learn more about this ancient craft grew he took an array of classes at Vermont Institute of Artisanal Cheese. He then started working at one of the oldest and most renowned sheep dairies in the US, Vermont Shepherd in Westminister West, VT. It was the owner of Vermont Shepherd who encouraged Joe to make his own cheese and thus Sawyer's Artisanal Cheese was launched. The first batch of this raw milk cheese was made in November 2010 and since it is made in Vermont and aged in Walpole, NH where we live we've named it Verhampshire. This semi-hard, washed rind cheese is aged six months. Verhamphire is mild, creamy, buttery in color with an earthy nutty flavor. Someone said it is reminiscence of a hay field on a summer day. We are fully insured, licensed and inspected by both states and are a member of the New Hampshire Cheesemaker's Guild. We won a Gold metal at the New England Cheese competition at the Eastern States Competition in Massachuettes. A blend of whole grain and white flour for a light but nutritious loaf. Topped with toasted sesame and sunflower seeds. Now available sliced for your convenience. Soft crust multi-grain sliced for your convenience.